Place hazelnuts, half the sugar and orange zest in a food processor; pulse until it nearly forms a paste; set aside. Place butter and remaining sugar in the bowl of a standing mixer fitted with a paddle; beat until light and fluffy. Add eggs and vanilla; mix on low speed until blended. With rubber spatula, fold in the nuts, taking care not to overmix. 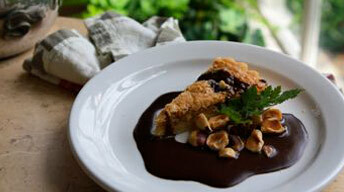 Spread apricot jam onto bottom of the pre-baked tart shell; pour in hazelnut batter to fill the shell. Bake about 45-50 minutes. Cool and drizzle with the chocolate ganache. Place butter in the bowl of a standing mixer fitted with a paddle. Add sugar; beat until just combined. Add egg and the vanilla; beat well. Add flour and salt; mix until the dough just starts to come together. Transfer dough to a lightly floured work table. Knead gently, adding flour if needed, just until the butter is incorporated. Form a disk, wrap with plastic wrap and refrigerate for at least one hour. Roll out dough and line an 11” removable bottom tart pan, trimming to fit. Chill tart shell for at least one hour. Preheat oven to 350°. Line shell with foil and fill with baking beans or pie weights. Bake for about 10 minutes. Remove foil and beans; return to oven and bake for 3-4 more minutes, until lightly golden brown and cooked through. Remove from the oven to cool until ready to use. Tart shell can be made a day in advance. Unbaked tart shell can be frozen for up to a month. Place chocolate in a small bowl. Heat cream to a near boil and pour over the chocolate. Whisk until smooth. Can be made a week in advance.